When a dragon has hatched from the egg, it is a slightly sodden creature, but dries off within a couple of hours and starts running and walking almost immediately. Within the next half week, the wings also firm up, and wyrmlings have been known to fly from as young as two days. Flying is a good advantage for the young, since they can easily escape earthbound predators this way. Dragons as a species have ancestral memories, this means that when the young are born, they have a substantial amount of their parents knowledge imprinted on their brain. This is not a complete working knowledge of everything the parents knows however, and is more a sense of identity as a dragon and the generalities of the world, which their parents can then expand upon if the species is of the type to stay with it’s parents. This awareness helps them to judge potential threats in the world, and helps them to use their innate abilities in overcoming obstacles. Wyrmlings are born with teeth and claws, although not very big they are still very sharp. They are also born with fully formed organs capable of producing a breath weapon. The area affected is smaller proportionally to the dragon then it is when it’s an adult, but it is still a breath weapon and more than capable of causing significant harm of injury. 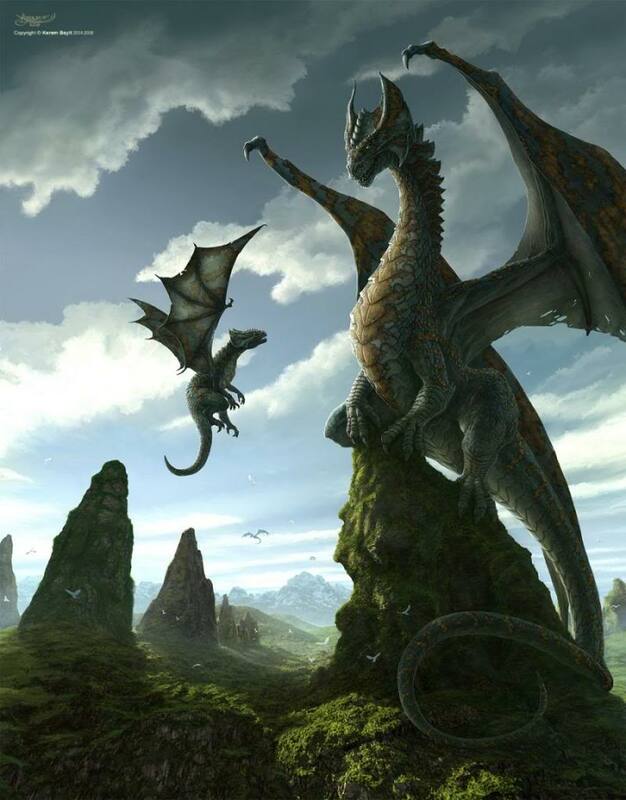 A dragon’s relationship with its parents tend to depend on the species, but most species who are not overly protective of their young will accompany them on their first few hunts, but then leave the young dragon to hunt on its own, developing the skills and memories it was born with through practice. Wyrmlings will stay with their parents for a few years, learning more things like how to look for a good lair, picking good territories, and how to pick the best items to hoard and other skills for draconic activities. 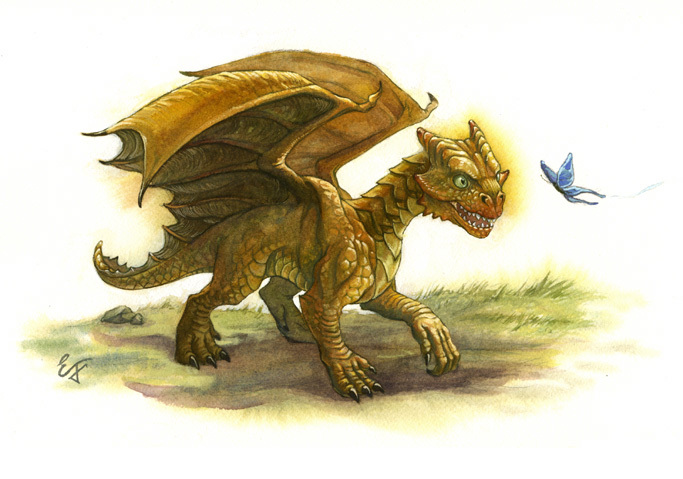 Wyrmlings who were abandoned or orphaned still have a good chance of surviving due to their ancestral memories and innate abilities, but to takes longer for them to learn skills without a parent to show them, and they are at danger from larger predators without an adult dragon to drive them away. Whilst wyrmlings are roughly the size of a large wolf, young dragons are approximately the size of a horse. Very young dragons are still honing their skills and instincts, sometimes with the aid of parents but mostly by themselves, but by the time they get to the young stage of life they have all the instincts of an adult dragon, including hoarding and territorial claims. This is when most dragon will leave the nest, through choice to go and find it’s own territory, or because the parents kick them out to preserve their own territory or hoard. Quite a few dragons are known to leave before this phase, so as to keep the relationship between parent and child a loving one in the future. 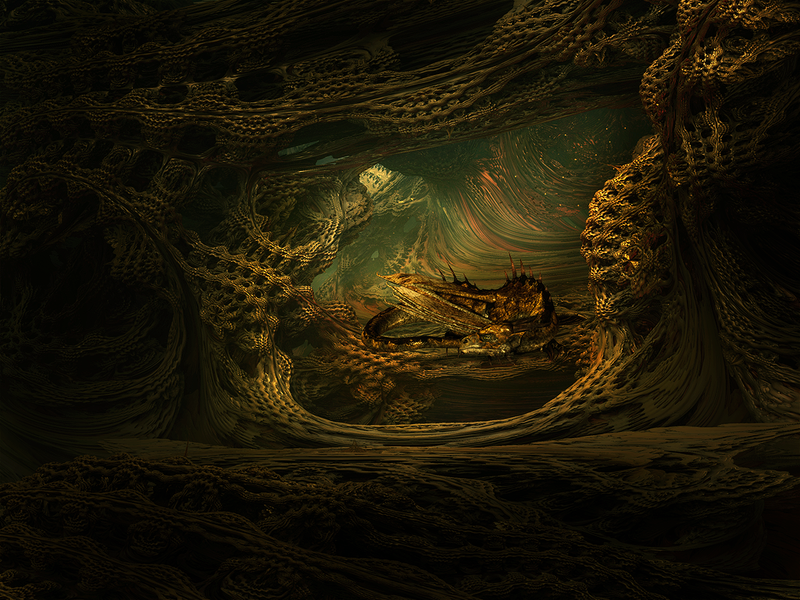 The first thing a newly separated young dragon has to do is find a lair of its own. This is like a coming of age trial, as they have to find a place which is not already occupied by another dragon, has adequate resources, and a good lair for the dragon to sleep, live and hoard in. At this stage, the dragon will prefer to find a lair, in an old castle or mountainous cave, that in can inhabit since that means the work has already gone into creating a space. Later in life they are more able to build one, but for this point they need a base to work from and do not have the resources to build their own. Once they have a lair, they can establish their territory, usually this will be what the dragon can fly over in a day from the central point of its lair. And then they can start building their hoard. At this age, the dragon will take to attacking caravans and travellers in the pursuit of something to add to it’s lair. They are unsophisticated in their approach at this age, and unselective in the pursuit of treasure. As they grow older they become wiser and more selective, but every dragon has to start somewhere with their hoard. From this point on, the dragon’s habits are set, and whilst they will develop new approaches, wisdom, and bigger hoards, the foundations of who they are have been developed and the juvenile stages of their life pass into adulthood. And we’re done! Penultimate post finished! See you all tomorrow at the finish line! Oh, and a huge shout out to digitaldivaducky and Tom Benson for featuring my blog on theirs! Impressed yet again with your devotion to this topic and your ability to fill the month’s posts. This is an area I hadn’t considered, at least as far as the gradual steps. Great stuff.